Since 1988, Simi Flooring has been dedicated to providing its Southern California community with top-quality flooring options and a commitment to excellent customer service. Simi Flooring is Ventura County's largest showroom and flooring store. For the past 25 years, Simi Flooring has been dedicated to selling only the best, name-brand hardwood, tile, laminate, and carpet at affordable prices for your family. 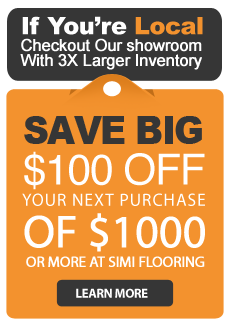 As a family owned and operated business, Simi Flooring offers great deals and special promotions for members of its local community. If you would like to contact us with any comments or questions regarding products, orders, or services, fill out the form with a detailed message, and we will be in touch as soon as possible.